Ravnica is home to ten guilds—one for every pair of colors—but Ravnica Allegiance hosts just half of them. Like Guilds of Ravnica's quintet of guilds packing power for Commander, Ravnica Allegiance brings its own powerful plans for the other five. From the lawmaking Azorius to the sublimely reckless Gruul, each guild has a new wrinkle on getting into Commander action. This is your high-level guide to commanding the guilds of Ravnica Allegiance. Azorius is the white-blue guild, thematically serving as the central governance and arbiters of the laws of Ravnica. Mechanically, this puts the Azorius into the wheel of controlling Magic gameplay. Azorius decks want to take control of the game. While blue always packs its share of counterspells, pairing that idea with white leads to much more powerful applications. Locking down what an opponent can do—stymying or outright preventing their ability to act—tops what Azorius offers. Combined with the ability to draw cards, deal with creatures (and other permanents like artifacts or enchantments), and play a few fliers, it's easy to see how games can go. What gives the Azorius truly frightening power is the ability to set all kinds of rules. Lavinia, Azorius Renegade puts a serious rider on decks that cheat or accelerate into spells off artifacts or other mana generation. Forcing opponents to "play fair" is exactly what the Azorius want: they define what fair means, then beat you with experience. Of course, it's not a 100% win rate just for acting the judge in a game. While slowing down and interfering with opponents is fine for a time, no one lawmage can lock everyone up. Closing a game quickly isn't the Azorius style, which gives opponents time to fight through the cuffs that bind them. Digging for more cards and setting up a moment to take the game over again is the only path forward. If you can draw enough cards to keep ahead of opponents' threats, you'll never have to worry about rushing to judgment. When you pick your battles and have the resources ready to win before you start you can't possibly fail. Saving Emergency Powers for a crucial moment to recover from destruction will make or break a victory. I'm sure your new guild leader would agree with that kind of plan. Rakdos, the black-red guild, knows how to throw a party. As performers and other (sometimes questionable) service industry "professionals," they put on a show—whether or not you want to see it. Mechanically, they quite literally deliver a spectacle of damage, attacking, destruction, and violence. Unlike the Gruul though, Rakdos are delightfully intentional with their actions. When you're playing with Rakdos, you're playing with fire (and probably a wide range of bladed implements). When you want to go all out and just do something every turn, it's to the Rakdos you should turn. Unlike other color pairs, Rakdos aren't afraid to empty out their hand and commit everything to the battlefield. From powerful performances (enchantments like Captive Audience) that instruct your conscripted players to destructive spells and efficient creatures, you'll be hard-pressed to not play things constantly. Judith, the Scourge Diva and Rakdos, the Showstopper embrace this philosophy perfectly together: Judith makes every creature you play stronger, and when Rakdos himself shows up, everyone who "played their part in the show" rewards you with damage anywhere you need it (assuming your coin flips don't all come up heads). Rewarding the tendency to go all in matters. Of course, that breakneck pace and all-for-the-show attitude isn't a long-term plan, which is an essential component of Commander games. While the rewards of going for the big play are too great to ignore, there are ways for Rakdos to keep going once opponents catch up. Enchantments that push through continuous damage or offer opportunities for more cards ensure there's always a new piece of entertainment. And something like Pestilent Spirit turns tiny spells of damage into devastating swaths of destruction for opponents. Just remember that the show must go on. Gruul is the red-green guild on Ravnica, who were once the protectors and stewards of nature there. As the megalopolis took hold, the Gruul were left without a purpose and now push back against the overreaching buildup of civilization itself. Mechanically, these disorganized groups punch, wreck, and destroy creatures, artifacts, and even the very land itself whenever they want. Gruul decks don't wait around for others. With big creatures and things to do, they come stomping in regardless of whether anyone else is ready. Wiping out roadblocks and hitting hard with creatures are the hallmarks of Gruul planning—and the end of it. With enough brute force, there isn't any defense that can withstand the pummeling. It's why Nikya of the Old Ways and Cindervines are such a potent duo for Commander. Not only do you accelerate into more and more creatures, by casting Cindervines before Nikya (since it doesn't work the other way around), you push opponents to fight on your favorable terms and keep a Naturalize in your pocket for when it's needed. But relying on creatures to do the heavy lifting leaves you vulnerable to opponents good at dealing with creatures. Finding ways to close out a game quickly—quite the opposite of an Azorius plan—is paramount. While red and green have a few ways to pick up extra cards, you'll never keep pace with anyone playing Islands. Instead, using creatures that can find things you need and enchantments that can make what resources you have (creatures, lands) stronger can be just the push a Gruul deck needs. And for a splash, borrowing a page from the Izzet playbook with something like Electrodominance can ensure you get first say on what happens when you untap for your next turn. If you have more mana and more creatures every turn, the walls your opponents hide behind will fall right over. Orzhov is the white-black guild, serving as the central bank and most popular religious organization. Mechanically, it's exactly what you'd expect from a bank you worship: power to answer nearly anything with every ounce of value you can extract from what you have to offer. When you're Orzhov, you almost feel like the Azorius at times by playing powerful enchantments and creatures that set new terms for how opponents can act. But, importantly, your deals don't hurt you and almost always come with extra benefits your way. Trading resources is another benefit to being Orzhov, with afterlife creatures carrying on their duties for you and exiling cards from graveyards to become your next payment for power. It's why Teysa Karlov is so feared within the Orzhov: getting double your return on a trade quickly adds up in value. On top of all that, removal is strong in Orzhov hands. Black and white together get to answer nearly any kind of permanent and are especially effective at clearing away a cluttered battlefield of creatures. Setting up value and removing anything annoying are easy as Orzhov. All that power comes at a steep price though: speed and resources. Spending life, or creatures, or cards in your graveyard are all ultimately limited in total. Setting up an army of Spirit creature tokens or an impenetrable defense takes time. To balance trading out creatures or other cards for another effect with making moves to attack is tough. That's the downfall of Orzhov's strength—the longest value return with the slowest start. After all, interest payments only add up over time. Finding ways to buy time, and perhaps pick up more value along the way, matters. Pressuring with the boost from Ethereal Absolution or buying just a little more time with Angel of Grace can both give you the room to stick around and stay ahead. You can't collect a debt if you can't knock on the door. Simic is the green-blue guild, serving as scientists for life and conservationists of the world. Mechanically, they play to blue and green strengths of clever spells and powerful creatures, making amalgams of creatures with a consistent focus on +1/+1 counters. Being Simic is an interesting intersection. Like other blue guilds, drawing cards, returning permanents to players' hands, and countering spells are all at your fingertips. But like green guilds, strong creatures and the means to attack well are available too. This mix is at home as a midrange strategy, taking good defenses and pairing them with efficient threats. Building up +1/+1 counters is the common thread across many Simic cards, and leaning into a sea of upsized creatures with effects that pay off from them works well. Zegana, Utopian Speaker asks you to have creatures with +1/+1 counters around, and Simic Ascendancy is a straight path to victory if you can keep the enchantment around. But all those creatures keep the same weakness as any creature-based strategy in Commander: battling through the opposition. Fortunately, the Simic pack quite a range of options. Counterspells on a creature, exiling opponents' creatures, copies of our best attackers, and the ability to jump ahead on mana give Simic decks plenty of play. The weakness of Simic decks is, paradoxically, its strength: you have so much flexibility you can lose focus. A commander like Prime Speaker Vannifar pivots the cards and strategy of a Simic deck orthogonally. Even just balance between advancing the game with creatures and setting up Simic Ascendancy takes careful planning. Losing focus and setting up too many experiments has been many a scientist's downfall. Ravnica Allegiance is packed with ways to start up Commander for any of these five guilds (Get a refresher on getting started with the format if you need it first! ), but it's just the start. Guilds of Ravnica won't add multicolor options for your new guilds, but tools like Conclave Tribunal and Vivid Revival still work wonders all the same. 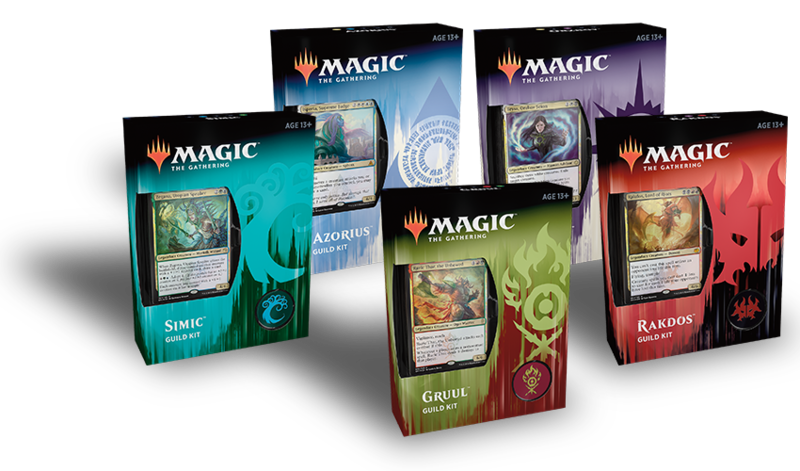 New guild kits specifically for the five "new" guilds hit stores in a few more weeks, just in time to add another wave of classic commanders and powerful cards to use. And, of course, the community is already hard at work breaking down the latest cards and building up the newest commanders from Ravnica Allegiance. May your guild still always prevail!